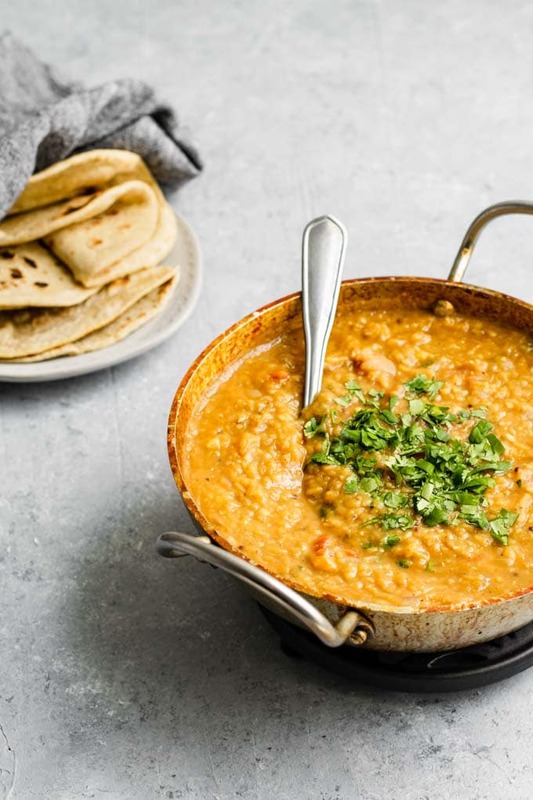 Dal (also spelled dhal or daal) is one of the most versatile, healthy, filling, and delicious meals. 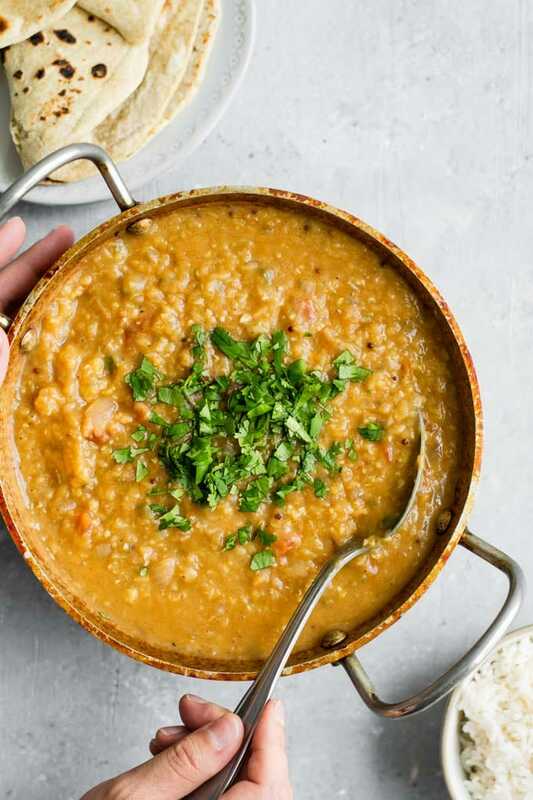 Dal translates to lentil, but when referred to in the context of food it means a spiced Indian lentil soup. 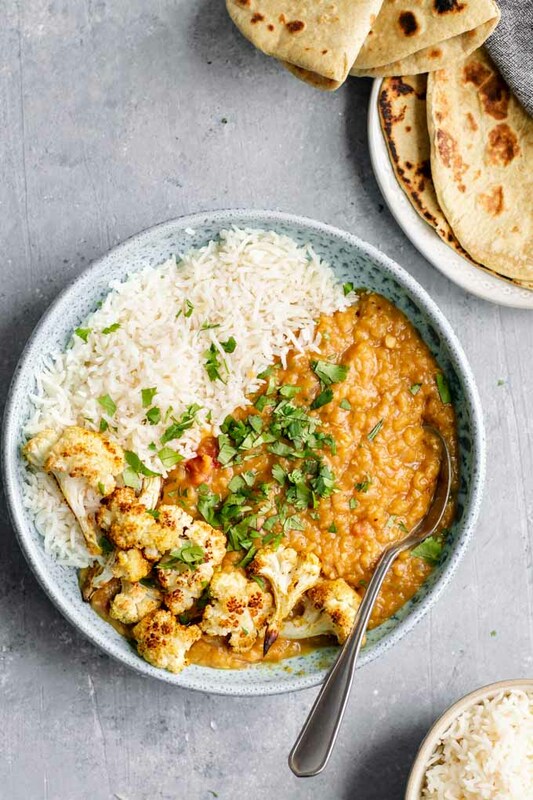 Dal can be made thick or thin, and with any kind of lentil. It can be made with cream and butter, or with a simple tempering of spices. No matter how how it’s made, it’s sure to turn out tasty. 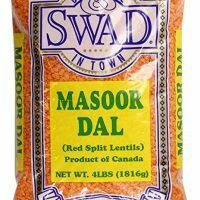 Masoor dal is the same thing as red lentils, which are popular and easy to find at many grocery stores in the US. They’re super cheap and cook quickly making them a great choice for a simple weeknight meal. This recipe is naturally gluten free, high in fiber and protein, low in fat and calories, and packed with flavor. You’ll find yourself coming back for bowl after bowl of dal. 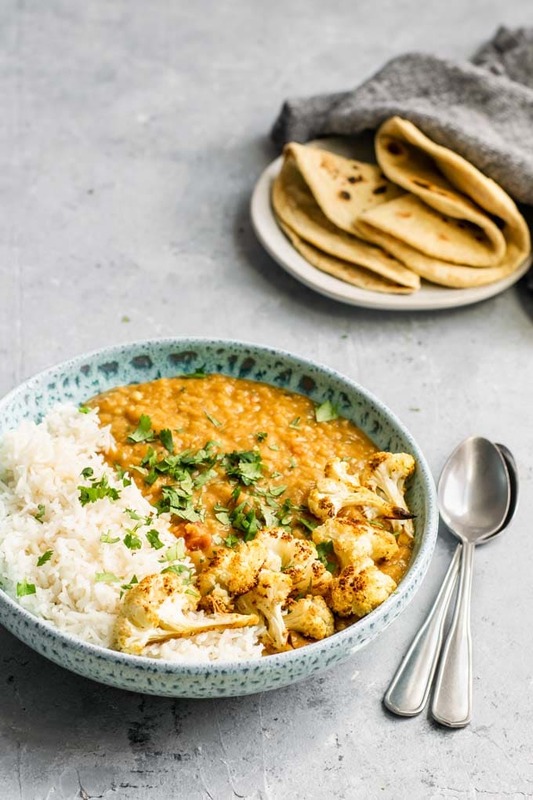 Serve with some basmati rice and if you’d like a veggie filled curry or some simple curry roasted vegetables for a complete meal. You can feel good knowing that with each delicious serving of masoor dal you are getting important nutrients like folate, iron, phosphorous, potassium, magnesium, manganese, and zinc. A tadka is a cooking method where spices and other aromatics are cooked briefly in hot oil to bring out their best flavor. It then gets added to a sabzi (vegetable curry dish) or dal (lentil curry) to infuse that recipe with its flavor. It’s a brilliant way to create delicious dal, as it allows for the varied cooking times of different kinds of lentils. Even from batch to batch of lentils the cooking time can vary, as fresher dried lentils will cook faster than old lentils that have been sitting on the shelf for a couple of years. Cooking the lentils separately allows them to get to the perfect level of tender before adding the flavorings. 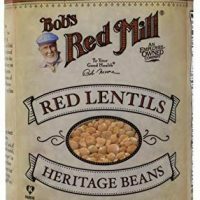 It gives a chance for the tomatoes to cook without inhibiting the cooking of the lentils (only add tomatoes after the lentils are tender or they may never fully cook)! And keeps the onions from getting too soft, which gives a bit of texture to the final soup. Having this texture from the tadka is particularly important with masoor dal which will pretty much completely break down when cooking. Before cooking any lentils, be sure to sort through them for any debris or stones. These days the mechanical sorting is quite good, but I’ll still find the occasional small stone no matter what brand I buy, and no one wants to bite into one! I easily do this by measuring out the lentils, then pouring them onto a white dinner plate in portions so I can quickly visually go through them. Once inspected, I move them into a fine mesh strainer and once I’ve gone through all the lentils I rinse them very thoroughly. Rinse the lentils until the water runs off clear, and while you could just run lots of water over the lentils in a strainer, I prefer to rinse, then put the lentils in a pot and add water to cover before swishing around with my hands. The water will turn cloudy, then drain out that water and repeat adding water to the pot and swishing around until the water runs clear. Once the lentils are rinsed, add them back to the pot with fresh water. Bring the water to a boil, and if you see any white foam at the top of the pot, skim off what you can. Then turn the water down to a simmer, partially cover, and set a timer. When the lentils are done they’ll be tender but still have some texture. They’ll cook another 5 minutes once the tadka is added, so try not to over do it in this first round of cooking! 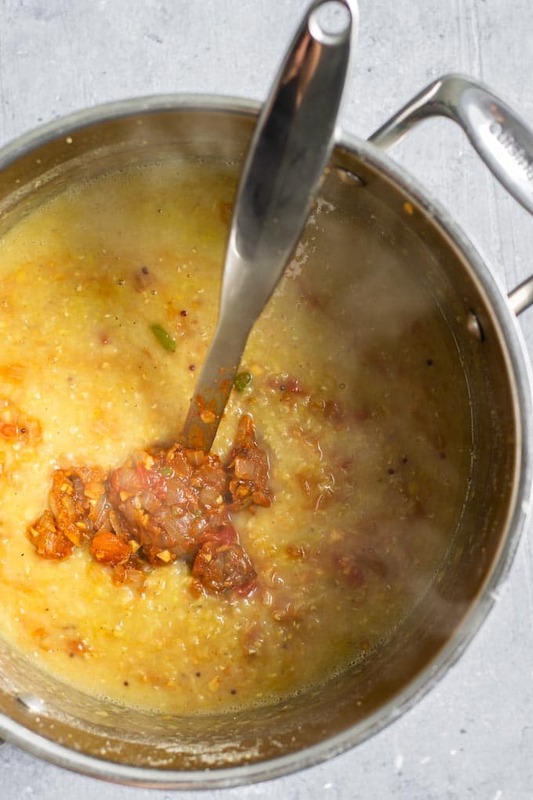 While the lentils are cooking, make the tadka. As explained before, the tadka is where alllll the flavor comes in to the dal. Heat some oil, fry aromatics like onion, garlic, ginger, and chiles until they’re soft. Then add spices: curry powder, mustard seed, coriander, and cumin. Add plenty of salt, as salt is what blooms the flavor on our tastebuds. As we’re mainly using ground spices which burn easily, we just briefly let them sizzle along with the onion mixture before adding tomato. Cook the tomatoes until the tadka is thick and saucy. Add the tadka to the cooked lentils. Let the two simmer on low together for just a few minutes to help the flavors meld. Taste the dal and add more salt to taste. If the dish tastes flat, or like it’s missing something, chances are it just needs more salt. 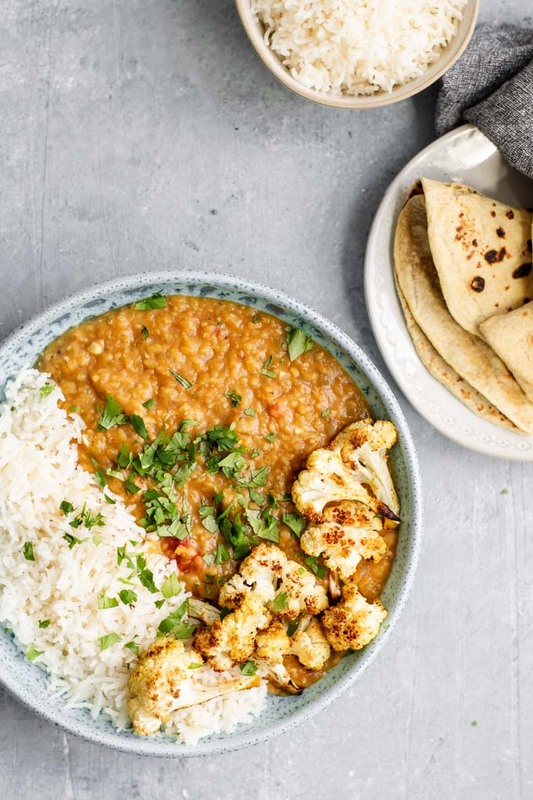 Serve hot with cilantro to garnish and a side of basmati rice. It’s also great served with some Indian bread such as homemade naan or chapati (pictured). I roasted up some cauliflower with curry powder to make this a complete meal. 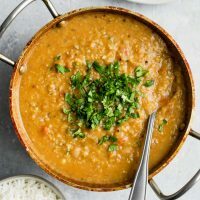 If you enjoy dal, check out some of my other dal recipes, and some other Indian recipes while you’re at it! 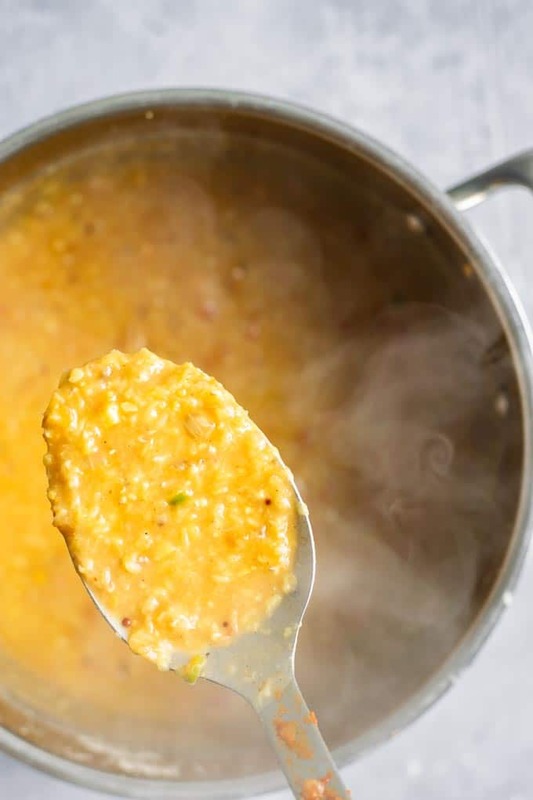 If you make this masoor dal tadka, leave a comment below and rate the recipe on the recipe card. And please share your photos with me on Instagram, tag @thecuriouschickpea and #thecuriouschickpea. I love seeing your recreations! WANT MORE DELICIOUS VEGAN RECIPES? SIGN UP FOR MY EMAIL NEWSLETTER AND FOLLOW ME ON INSTAGRAM, FACEBOOK, AND PINTEREST! 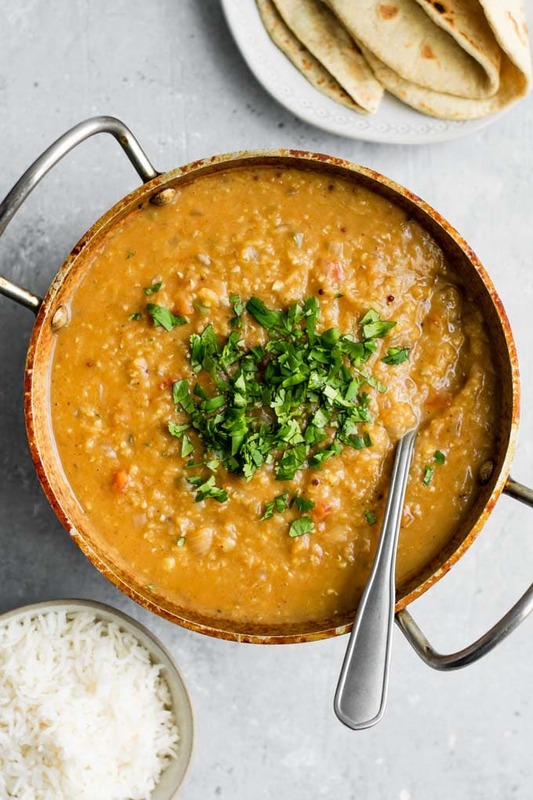 Masoor dal tadka is a delicious Indian lentil curry made with red lentils. It's easy to make, naturally vegan and gluten free, and full of flavor. Combine the lentils and water in a large pot. Bring to a boil, then turn the heat down to simmer. Skim off any foam that collects on top. Cook, partially covered, until the lentils are tender, usually 15-20 minutes. While the lentils are cooking, make the tadka. Heat a skillet over medium heat and add the oil and onion, garlic, ginger, chiles, and a pinch of salt. Fry until soft, about 5 minutes. Add the spices: curry powder, mustard, coriander, and cumin, along with the salt. Stir to combine and cook for about 60 seconds, then add the tomatoes. Cook about 7 minutes to cook down the tomatoes if canned, or until the tomatoes are soft and saucy if fresh. Add the tadka to the cooked lentils, and simmer over low heat for about 5 minutes to infuse with flavor. Serve garnished with cilantro and with basmati rice. Cook time can vary for lentils depending on how fresh they are. Very fresh lentils take less time to cook, whereas if they've been sitting around for a couple of years they may take longer.